With Falcon Heavy successfully accomplishing its demonstration flight earlier last month, many in the rocket industry have been questioning the need to continue NASA’s expensive development of the Space Launch System (“SLS”). But, due to the number of jobs at stake, I believe that the SLS Program is still far from its demise. Additionally, the large payload capability of the SLS rocket will enable it to play an important role in the future of America’s space policy as NASA plans our return to the Moon. Furthermore, the multitude of opportunities available in Deep Space can more than accommodate many different rockets. Hence, the SLS Program is unlikely to fade into the background anytime soon. 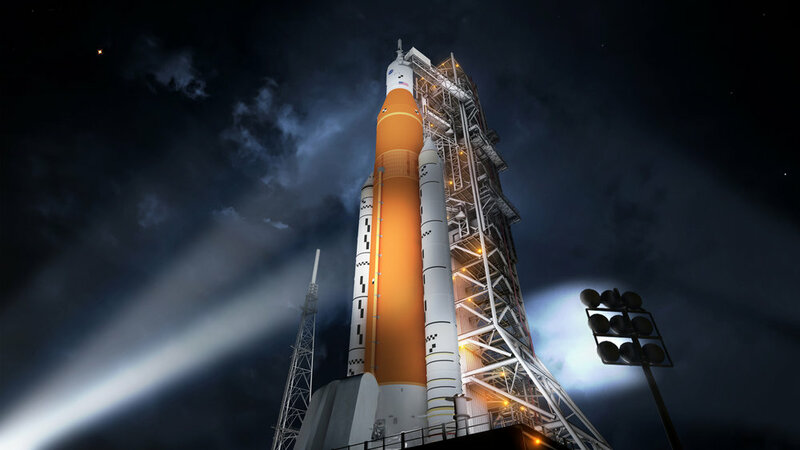 Similar to many other NASA projects, SLS has had its share of delays and costs overruns. The SLS Program was originally estimated to cost $7 billion with a projected maiden launch date in 2017. But now, the SLS’s maiden voyage, via Exploration Mission-1 (“EM-1”), has slipped to a launch date of no earlier than mid-December 2019, and the program had exhausted its original $7 billion budget by 2015. From 2011 to 2017, NASA has already spent over $11 billion in development costs on the SLS. Estimated to need another $10.6 billion in funding for 2018-2022, the SLS Program will cost at least three times as much as its original proposed budget. Many in the rocket industry have criticized these delays and cost overruns. More recently, members of Congress are starting to express their concerns with the project as well. With Falcon Heavy’s successful demonstration flight, a changing paradigm is starting to take hold in the rocket industry. After all, Falcon Heavy only needed about $500 million to accomplish its maiden voyage, and many are wondering whether commercial entities are better suited to develop America’s next generation of heavy-lift launch vehicles. President Trump recently added fuel to this discussion by implying that the Falcon Heavy would have cost a lot more if it were developed by NASA. But even with the cost overruns and launch delays, the SLS Program is unlikely to be cancelled outright due to its status as a job creator. First, budget overruns are common with many of NASA’s iconic programs. The International Space Station was well over its planned budget by at least $4 billion and each launch of the Space Shuttle Program cost $390 million more than its original projection of $54 million (inflation adjusted) per launch. Such increased costs is an inherent problem of a fits and starts, year-by-year, governmental budget approval process that hinders long-term planning. Since this problem is not unique to the SLS Program, these overruns are unlikely to lead to SLS’s demise. SLS’s large launch capabilities will also create a special role for the rocket in the construction of Deep Space stations. SLS is designed not to be just a heavy-lift launch vehicle like the Falcon Heavy. The SLS rocket is envisioned to be a part of the super heavy-lift class of launch vehicles that can launch more than 50 metric tons (110,000 pounds) to low Earth Orbit (“LEO”). Although Falcon Heavy has become the biggest rocket launched since Saturn V, its launch capabilities are still far inferior to SLS rocket’s planned capacities. The initial configuration, Block 1, of the SLS Rocket is designed to launch 70 metric tons (77 tons or 154,000 pounds) to LEO. Ultimately, SLS, via its Block 2 configuration, can launch 130 metric tons (over 280,000 pounds) to LEO, eclipsing every other existing super heavy-lift vehicle other than the Saturn V (which had a capacity of 140 metric tons (310,000 pounds) to LEO). In comparison, the Falcon Heavy can launch at most, with a fully non-reusable version, 50 metric tons (about 55 tons or about 110,000 pounds) to LEO. By having such a large capacity, SLS will be able to play a major role in the construction of deep space stations such as the recently renamed gateway around the lunar orbit, Lunar Orbital Platform-Gateway (“LOP-G”). Using the SLS Platform, NASA would be able to transport more components and construction materials to the Moon with fewer missions. Since only big governmental projects would require such expansive space-faring capabilities, the commercial industry will be unlikely able to successfully develop a similar rocket anytime soon (but see below on SpaceX’s and Blue Origin’s current efforts). Hence, the SLS Program, with fewer short-term cost constraints and profitability concerns, could be the only rocket capable of serving such demands. But with the commercial rocket industry looking to dabble in the super heavy-lift vehicle class as well, there might be additional pressure for the SLS Program to show progress in the nearer term. Both SpaceX and Blue Origin are developing their own versions of the super heavy-lift vehicle as well. SpaceX’s BFR will be capable of launching 150 metric tons (330,000 pounds) to LEO. Meanwhile, Blue Origin’s two-stage version of the New Glenn rocket is designed to lift 45 metric tons (99,000 pounds) to LEO, with a three-stage version also planned. Both the BFR and New Glenn are expected to make their maiden voyages shortly after the current projected SLS’s test voyage. Earlier this week, SpaceX announced that it will begin suborbital tests of the BFR in the first half of 2019 with the first full test flight scheduled for as early as 2020. Blue Origin is expecting the debut of the New Glenn in 2020 as well. While the launch capacity of the two-stage version of the New Glenn is much less than that of the SLS, with a three-stage version in the works, both commercial rocket platforms should have enough capability to compete with the SLS for transportation missions to Deep Space. However, whether NASA would be willing to use either of these rockets in favor of its own “in-house” developed platform remains to be seen. But, if the SLS’s development is plagued by further delays and cost overruns, NASA might not have a choice in the matter. However, the development of these commercial rockets might not be zero-sum game for NASA. Any success here might provide a much needed jolt to the SLS Program as NASA tries to maintain its monopoly on Deep Space transportation systems. Furthermore, the number and types of missions available for Deep Space exploration can more than accommodate these entities as well as their rockets and much more. While our understanding of Deep Space is still in its infancy, one thing that we do know for certain is that the possibilities in Deep Space are limitless.